* Do you have enough money to retire? * How can you manage your income and expenses so you don't outlive your 401(k) balances? * How can you invest in your health, so that you won't be wiped out by large medical expenses and are able to live a long, comfortable, and productive life? * What can you expect from Social Security and Medicare? * What's the best work/life balance for prosperity and fulfillment? Live Long and Prosper! 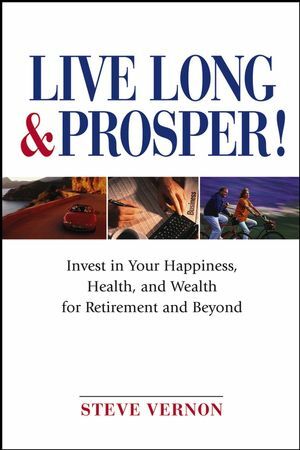 will help you move beyond the traditional view of retirement and begin planning for the rest of your life. STEVE VERNON is a Vice President of Watson Wyatt Worldwide, one of the largest human resources consulting firms, with eighty-eight offices in thirty-one countries. For thirty years, he has helped some of America's largest corporations design, finance, administer, and communicate their retirement programs. For more information, visit www.restoflife.com. SECTION ONE: PERSPECTIVES FOR REST-OF-LIFE. Chapter 1: Trends—The Past and Future of Retirement. Chapter 2: How Long Will We Live? Chapter 3: What Do We Really Want? Chapter 4: What, Me Work? Chapter 5: What Should I Do? Chapter 8: Just in Case. Chapter 9: How Much Is Enough? Chapter 10: Don’t Die Broke! Chapter 11: Which Investments Should I Use? Chapter 12: Where Should I Invest My Money? Chapter 13: Uncle Sam Wants to Help—Sorta. Chapter 14: Social Security, or Insecurity? Chapter 15: Getting the Most from My Pension Benefits. Chapter 16: Squeezing the Last Drop. Chapter 17: What, Me Work?—Revisited. Chapter 18: Let’s Spend Our Money! Chapter 19: Answering the Three Big Questions—Examples, Tools, and Templates. Chapter 20: Answering the Three Big Questions—Observations and Strategies. SECTION FOUR: PUTTING IT ALL TOGETHER. Chapter 21: Ya Gotta Wanna. Chapter 22: The Twenty-First-Century Model for Our Rest-of-Life.